Brought to the UK from India as a small boy, Mitu Misra became entranced as a child by the movies. After the death of his father however, in the Asian tradition he found himself at the age of 16 as the eldest son responsible for the support his family. He founded a business, made a lot of money, enough to secure his family’s comfort, and finally sold his company in order to follow his dream to become a film maker. With a “training” not dissimilar to that of Quentin Tarantino, having seen zillions of films but never having made one, he walked onto the set on the first day, he has admitted, having to ask the crew what a boom was. There are several things to enjoy in this, Misra’s feature film debut, most particularly some of the acting talent on show but the piece suffers from the film maker’s apparent determination to stuff into the film every thought he’s ever had about race, gender, religion et al and indeed about film making itself. The story is set largely in Bradford’s Asian community, where Misra grew up. The central character is Donald (Byrne), chauffeur to Demi, a wealthy businessman, played by Harvey Keitel in a brief cameo – so brief in that no sooner have we met him, than he is found dead. Donald is tasked with clearing the apartment where Demi entertained his mistress of all evidence of his (married) boss’s affair. While he is doing that, the mistress, Amber (Deen), shows up and Donald finds himself drawn into a dark drama involving her challenges and conflicts with her traditionalist Muslim family and most importantly with her violent, gangster ex husband (Uddin), who is now planning to marry her younger sister – an arranged marriage which Amber is trying to save her from. Donald too has his problems, involving his ex wife (Gina McKee), also in a cameo role and there is mention of a dead child. Also on hand is Mark Addy as his brother in law. Every film needs a back story but in this one the complicated history of the characters tends to overwhelm the narrative more than somewhat. On the plus side Byrne holds it all together in a rather different role to those we usually see him play. Northern as opposed to Irish and a more mature and ostensibly less dynamic figure, who is forced into action by his innate humanity. Sibylla Deen, a new face to the big screen, is both very beautiful and promising actress, while Uddin as her bullying ex, who has back story conflicts of his own, is both impressively handsome and nasty. 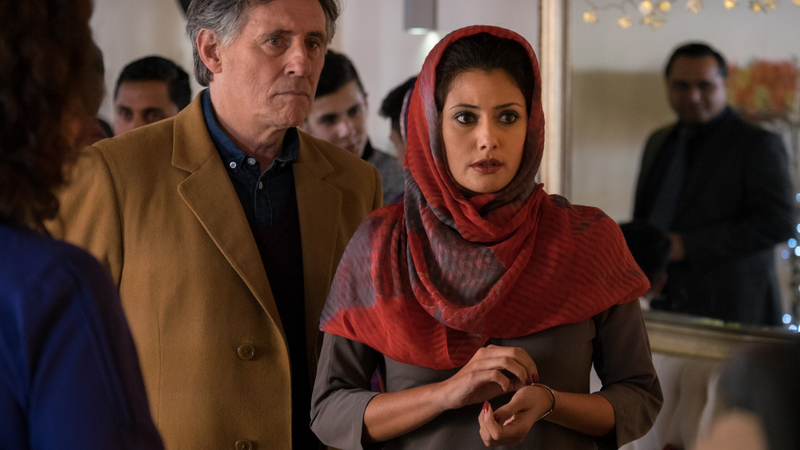 It is important that we have stories about the Muslim community, who are now a significant element in our society, though its members may not be best pleased at their portrayal in this film. Shan Khan’s rather more cohesive 2014 film The Mother”, which dealt with the controversial issue of “honour” killings and was rather good, disappeared from sight very quickly and this movie may well suffer the same fate.